In the distance, beyond the lotus-topped building of the Sri Sathya Sai Institute of Higher Learning, Anantapur Campus, is the Lion Hill, which, in certain seasons, looks purple and majestic against a crimson-red sky. One would think it was an ideal, sylvan setting for a College for women who, in the future, would bring forth into the world lion-hearted men and women – men and women that would restore to Bharat its lost glory. But, where did it all begin? Where was this dream born? It took shape in the heart of one of the noblest women of our time, one who, no matter how rural her background, had the courage to visualize a brave new world. Mother Easwaramma imparted her dream to her Divine Son, Bhagawan Sri Sathya Sai Baba. She wanted that the women of this country, generally regarded as weak and helpless, be fully empowered, and provided with the tools of education so that the dying roots of traditional values may be revived with the mastery of Character and Culture. As the women, so the families; as the families, as Manu says, so the societies; as the societies, so the nations; and as the nations, so the world. Inaugurated on 8th July, 1971, the building is an architectural archetype of all Sai Institutions. It is circular in shape, symbolising the fulfilment of the search for God. As Sri Kasturi wrote, it looks “like a prayer rising up from the heart, a poem of praise for the Giver of all Good.” The then Minister of Education said, on the occasion, “When Baba establishes a college for women we may be certain that it will not be just one among many. It will be a beacon, a lesson for others, a model, a pioneer.” And, what did Beloved Bhagawan have to say? 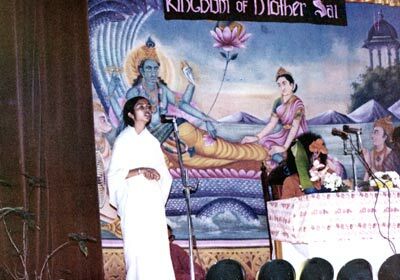 Bhagawan Baba concluded His Divine Discourse with a powerful, prophetic statement, “The seed has been planted; it will sprout and spread, heavy with fruits, providing shade, security and sustenance to all.” Little did anyone know, or dream, that one day, on the strength of the achievements of this Women’s College, the UGC would consider Deemed University status for the Sri Sathya Sai. The College began with a modest figure of 125 students on 22nd July, 1968. Slowly, the strength increased, and a permanent building to house the growing educational project was opened on 8th July, 1971. It consisted of lecture halls, laboratories, a spacious auditorium, and a well-equipped library. The student strength in 1971 was 350. The first Master’s Degree Course was introduced in 1972 in Telugu Language and Literature. The Bachelor’s Degree Course in Commerce and Home Science came in 1975 and 1976, respectively. From 350 in 1971, the student strength increased to a remarkable 1250 in 1981 – the year in which, with the benign grace of Bhagawan, this College, along with its counterparts in Prashanthi Nilayam and Brindavan, became part of the deemed university, Sri Sathya Sai Institute of Higher Learning. A Master’s Degree Course in English Language and Literature in 1982, a P.G. 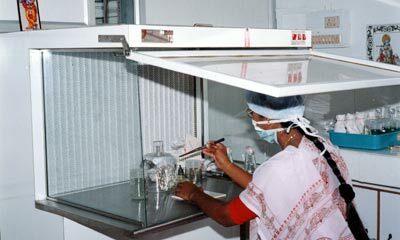 Course in Home Science in 1985, and a Bachelor’s Degree Course in 1986, a Computer Laboratory and a Plant Biotechnology Laboratory in the year 2000 complete the picture of the academic growth of the Women’s Campus. One of the truly remarkable features of the Sri Sathya Sai System of Value-based Education is that Bhagawan, the Great Divine Teacher, has envisioned a process of continuing transformation for His students. Education in Bhagawan’s Institutions does not finish with the acquisition of academic degrees. The values of love and service imparted to the students during their period of study have to, necessarily, be carried forward into society, and, from thence, to the world. The ends of education at the Sri Sathya Sai Institute of Higher Learning are Spiritual Upliftment, Self-discovery and Social Service. The educated receive many benefits from society, and they must return the favours received by working for the welfare of society. This is Sangha Neethi, says Bhagawan. If our education becomes devoid of basic human impulses such as kindness and sacrifice, modern children may grow with selfish traits and minds, indifferent to the sufferings of others. The ideal of EACH FOR ALL, and ALL FOR EACH may be replaced by EACH MAN FOR HIMSELF! Not only are the students of Sai Institutions trained in academic disciplines, they are also given exposure to the concept of self-help and service through the Self-reliance Programmes, and the Village Service Programmes organised during the Dassera break. 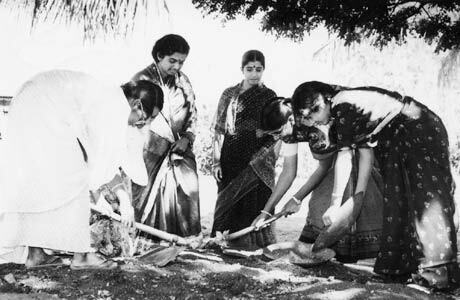 At Anantapur, right from the inception of the Sri Sathya Sai Arts & Science College (for women), Bhagawan’s instructions were that the girls should be taught all the household arts and skills, along with academic studies, since His idea was to uplift the status of women without jeopardising the social fabric of traditional Indian society. Therefore, the girl-students had to sweep their rooms themselves, cut vegetables, roll chapattis/puris, clean the campus surroundings on Sundays, manage the dispensary, oversee the water-supply, weed the gardens, etc. Apart from all this, they were trained to take literacy classes for the adult workers on the campus, and Bal Vikas classes for the children of the workers. 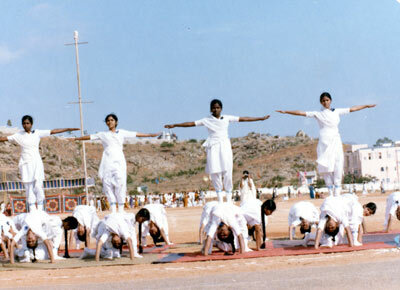 Though this routine may sound strenuous, regimental and demanding, since alongside these variegated activities, the girls had also to study for examinations at the end of each year, Bhagawan was very firm about the details of this discipline being meticulously observed, as the girl-students of those early years will testify. Bhagawan insisted that the College emphasise on the cultivation of physical health and mental equanimity, as well as scholarship and proficiency. As a result, Indra Devi, from Mexico, was invited to teach Yoga to the girls! Even today, in the Sri Sathya Sai Institute of Higher Learning, every student, boy or girl, is supposed to know the basic yogasanas for his/her mental and physical well-being. 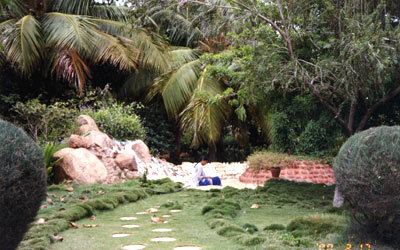 Bhagawan’s visits to Anantapur, in those early days, were Gifts of Grace. He would advice the students about the need for women to be ideals to society. He shared with them His vision of a resurgent India in which women, no longer ‘abalas’ or weak, were endowed with the moral strength to create a cultural revolution. During one of Bhagawan’s visits to Anantapur in 1968, He told the girls that, being the upholders and protectors of Culture, women had to be educated in a different way than men. 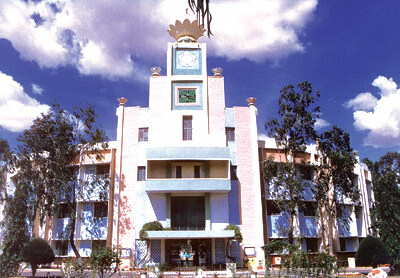 It was the duty of the elders, Bhagawan suggested, to see that the girl-students do not leave the institution without securing the ‘priceless treasure left by the sages of the past.’ A Women’s College, He said, ‘has the added responsibility to practise and preserve the essential values of Bharatiya Samskrithi.’ Thus, under Bhagawan’s Divine Guidance, an ‘Indian Culture’ Class was introduced - to be held every Thursday - to impart lessons on culture. Blessed was it in that dawn to be alive, to be young was very heaven. Bhagawan’s Divine Plan for the redemption of humanity charged every student with a sense of ‘mission.’ Though not the recipients of Bhagawan’s proximity with equal measure as the boys, the girls hoped to participate in the unfoldment of Bhagawan’s Plan, if not by doing Great Things, then by doing Small Things in a Great Way. It is against the purity and simplicity of this background that one needs to understand, and appreciate, the eventual formation of the women’s alumni association. As the girls sat silently together, next to the Mandir, one could sense their anxiety – it was almost palpable. Some had tears rolling down their cheeks, a fear having gripped them that maybe Bhagawan would leave them – the ladies – out of His mission. The routine of sitting and waiting, and, when Bhagawan came for darshan, calling Him out in One Voice to heed their prayer, went on for a couple of days. Finally, on the 26th morning, when Bhagawan came out for darshan, He walked straight to the ex-students seated next to the Principal and the Warden of the Sri Sathya Sai Arts & Science College , Anantapur, and said that He had discussed the matter with Sri Indulal Shah. It was decided to name the Girls’ Alumni Association “Kingdom of Mother Sai.” The girls heaved a sigh of relief, and tears of joy filled their eyes! They gave their names for enrolment into this Association to the office clerk-in-charge, and left for their hometowns. The formal structure of this “Kingdom of Mother Sai” had not been given by Bhagawan, but the ‘naming’ was itself a big step, they thought, and left their addresses and telephone numbers in the office register. After a lull of 5 months, in May, 1981, the final fulfilment came. Bhagawan’s College at Anantapur was preparing for Bhagawan’s visit – always an all-night, all-day affair – when around 10 pm, the night before, came a message from Bhagawan that when He comes the next day – 2nd May – He would formally inaugurate “Kingdom of Mother Sai.” A few of the ex-students who were working as teachers in the College, and some who were pursuing their higher studies in the nearby autonomous Post-graduate Centre and residing, with Bhagawan’s permission, in the College Hostel, were summoned by the Principal to the Auditorium where preparations were going on for Bhagawan’s visit the following day. Hectic activities commenced. The old girls collected the list of the students, who had given their names for membership, from the office. Working through the night, they got ready a banner, and a scroll, including all the names, and waited with bated breath for Bhagawan’s arrival. 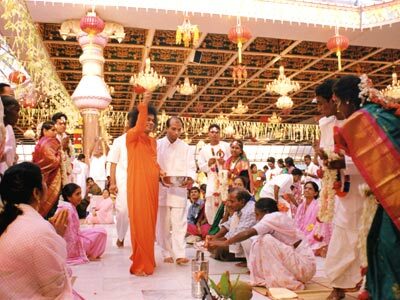 Bhagawan was received in a ceremonious fashion, and led to the Auditorium. 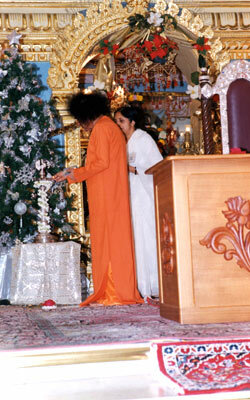 When Bhagawan was seated, a prayer was sung and the proceedings began. As coincidence would have it, Ms. K. P. Saileela and Ms. Shobana Nair offered the garland, and stood next to Bhagawan for the Lighting of the Lamp. Ms. Rajeshwari Patel spoke on the occasion. She thanked Bhagawan for accepting the role of the Inner Sovereign (‘King’dom of Mother Sai), and giving the girls an opportunity to participate and serve in Bhagawan’s mission. In the beginning, since the numbers were small, around 150 or so, and the largest single group of old girls were at Anantapur, the members centred their activities in and around Anantapur, and the villages on its outskirts. A variety of service programmes were taken up. Beginning with visits to the Govt. General Hospital and T.B.Hospital in the town, and an Adult Literacy Project, the girls took up road and gutter laying work in the village of Upparapalli, conducted Bal Vikas classes there, culminating with a skit (using the boys of the village in different roles) based on Bhagawan’s Cheppinatlu Chestara? at the end of a week-long service camp. They spent their summer break in the task of building mud-brick houses at Raptadu. Taking advice and medical assistance from the concerned government bodies, they also undertook sanitation work in many villages on the outskirts of Anantapur town, disinfecting wells, spraying pesticides in pest-ridden houses, getting wells dug, and, making door-to-door calls, generally instilling in the village folk the need to maintain health and hygiene through simple and easy-to-follow instructions about diet and a clean lifestyle. 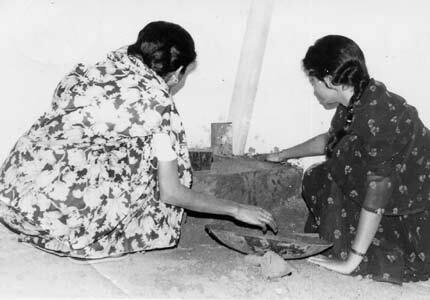 On the occasion of the 60th Birthday of Beloved Bhagawan, the girls built smokeless ‘chulhas’ for all the 60 houses in Subbamma Nagar, Puttaparthi. They organised two mass marriages programmes in the Divine Presence of Bhagawan at Prashanthi Nilayam. The expenses for all these activities were borne entirely by the members, and at no time were donations accepted. In the initial stages of the growth of “Kingdom of Mother Sai,” Bhagawan had, when asked, affirmed that when Good Work is taken up, money will automatically follow. He advised the Executive Council not to have any anxiety on this count, and laid down clear guidelines for the execution of service work. From 1981, till today, the “Kingdom of Mother Sai” has been self-reliant in its financial resources that are generated through the voluntary contributions of its members. With the number of members increasing, it became possible for them to take up service activities in their own hometowns – which is what Bhagawan has always emphasised: Charity should begin at home. As there were bigger groups of students in various towns and cities of India, they could plan service projects that require more volunteers. After a few years as “Kingdom of Mother Sai,” Bhagawan changed the name of the Association to “Messengers of Sathya Sai” since it was felt that the word “Kingdom” might create some misconceptions – though Bhagawan still continues to fondly refer to its previous name in Divine Discourses! Today, the “Messengers of Sathya Sai” has an official count of 2500 registered members. 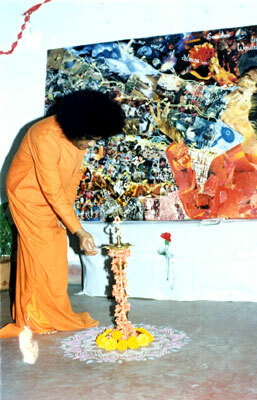 Since only those who have completed their course of study in the Institute, and have had full exposure to the philosophy and teachings of Bhagawan, are eligible, it is important to note that there are many more old students than are members of “Messengers of Sathya Sai.” The members are spread over all the states of India, except Jammu and Kashmir. The highest number of members is from Andhra Pradesh, with Tamil Nadu a close second, and Karnataka in the third place. Among overseas countries, United States of America has the highest number of members, with Nepal, England and Canada vying for second place. At the end of the year, every member is expected to give a report of the service activities undertaken by her in the course of 12 months. A consolidated report of the outstanding work undertaken is presented before Beloved Bhagawan on the 25th of December every year, when the Messengers gather at the Divine Lotus Feet of the Lord for the Annual day celebrations. It is next to impossible to give an exhaustive report of the service work being done today by the Messengers of Sathya Sai, but, needless to say, they are all inspired by the spirit of “Help Ever, Hurt Never.” A catalogue of the regular service being done would be difficult to prepare. The old girls do Security Duty in rotation throughout the year, wherever Bhagawan is, at Prashanthi Nilayam or Brindavan. 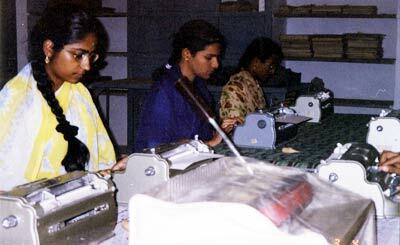 Braille typing of books on Bhagawan has been going at the Anantapur Campus of the Institute for several years now. Apart from the organization of Medical Camps (at various places like Cuddapah, Guntur, Bangalore, etc. ), Narayan Seva, EHV programmes, Free Tuitions for the economically underprivileged, and visits to Cancer Wards, Homes for the Retarded and Physically Handicapped, Leprosy Centres, Schools for the Blind, Old Age Homes and Orphanages, the Messengers contributed money and materials to victims of natural calamities such as the Orissa Cyclone and the Gujarat Earthquake, and to the National Defence Fund during the Kargil War. Besides participation in Environment Protection and Afforestation programmes, the Messengers in Uttar Pradesh are involved with the Society for the Prevention of Cruelty to Animals. Many of the Messengers in different parts of the country are sponsoring the education of school-going children from backward areas. They have initiated Balvikas classes in tribal areas, too! The Messengers at Hyderabad runs an adult education programme for the poor, and vocational training for underprivileged teenagers. The members at Chennai organise monthly medical camps – general, dental and acupuncture – at a fishermen’s village, Chinnaadi Kuppam. Messengers from Overseas actively participate in Sai Centre activities. In USA, Kuwait, Singapore, Israel, England and Canada, the girls have taken up the Education in Human Values programme at various centres to spread the Swami’s teaching on Educare. The members in different countries help the victims of natural disasters, contribute to and volunteer at Rehabilitation Centres, Cancer Hospitals and Nursing Homes for Senior Citizens. In some countries like the Philippines and Australia, they assist in organising/or volunteer at Medical Camps. Having been the special recipients of the Divine Grace and Love of Bhagawan, the Messengers believe they have the responsibility of sharing this grace and love with fellow brethren. The service activities they do may be big or small, as per their strength and resources, but they must never cease in this noble task: SERVICE TO HUMANITY is SERVICE TO GOD. The “Messengers of Sathya Sai” undertake all service-oriented activities as a humble and loving offering at the Divine Lotus Feet of Beloved Bhagawan, in gratitude to the Lord for all that He has given them, and taught them – a definitive spiritual goal, a noble path, and the loving way of walking it. “I hereby solemnly pledge to strive incessantly all my life for upholding the highest ideals of moral and spiritual living that I had the privilege of imbibing during the course of my study at Sri Sathya Sai Institute of Higher Learning, Anantapur.